In an effort to help developers better prepare their apps before submitting them for review, Apple is shedding some light on the top reasons it rejects app. According to the tech juggernaut, the top reason apps were rejected during the 7-day period ending August 28, 2014 was “more information needed.” This means that the developer left out at least some of the details needed to review the app, such as contact information or a demo. The second most common reason Apple rejected apps during the same time period was “bugs.” According to Apple, developers should test their app on all devices and fix all bugs before submitting it to the App Store, as submitted apps should be ready to publish. 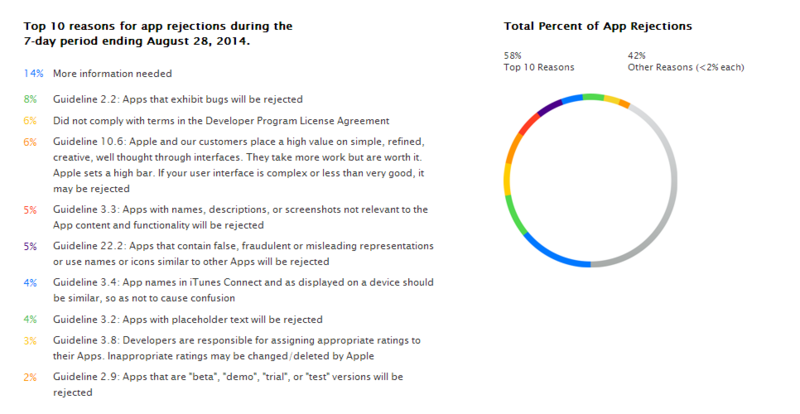 Check out the rest of Apple’s reasons for rejection below (click chart to enlarge). Some of the other tips Apple provides to developers include finalizing all images and text within apps before sending it in for review, providing accurate descriptions and screenshots, offering a “clean, refined and user-friendly” interface and making sure advertisements work correctly before submitting.